Discover unique accessories at local boutiques. Not your grandmother’s pearls: These contemporary pieces combine smooth freshwater pearls with jagged rock crystals for an updated take on a classic look. Accessories can tie a whole look together. And since we use them all the time, accessories can also make great Valentine’s Day gifts. 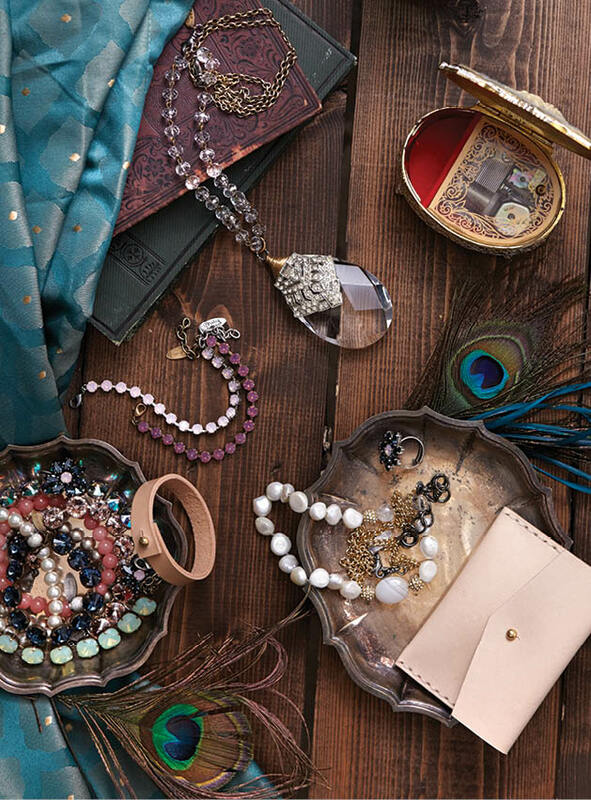 Edina’s boutiques carry excellent selections of accessories, including specialty items created by Minnesotan artisans, so you can shop local to find some unique options. Find items by Minnesota artist Laurie Luehmann at Dugo in the Galleria. Luehmann has created a collection of accessories made of pearls and sometimes antiques. Luehmann has been creating jewelry in earnest for about 10 years. She was an art and design major in college, and worked with art and antiques after graduation. Eventually, she had her own retail store in south Minneapolis called Luehmann. Though no longer open, people still remember her for the store, which featured antiques and jewelry. Today you can find Luehmann’s work at Dugo, and you’ll see how her experience with art and vintage artifacts has made its way into the jewelry. Though she once used more antiques, now pearls predominate, but she doesn’t make your grandmother’s pearl necklace. If that sounds like something your special someone might enjoy, take a look at her matching necklace and bracelet sets. A necklace made of smooth freshwater pearls and jagged rock crystal, and bracelets made with the same pearls and rock crystals, along with tiger’s-eye stones, make excellent gifts for a loved one or a lovely addition to your own accessory collection. Wrap your loved one in precious memories with a Donni Fly scarf with printed wings. For something a little different, head over to A La Mode Boutique and Nail Spa and take a look at the Donni Charm Scarf line. The line by Alyssa Wasko was inspired in response to the death of her father who used to call her his lucky charm. This Colorado girl turned her heartbreak into success, as the line is now sold in boutiques worldwide and worn by celebrities including Beyoncé and Sarah Jessica Parker. The scarves are made with high-end fabrics, and the story behind them makes them a great gift for any loved one. For someone who likes a little more edge to their outfit, try the “Donni Fly” scarf, in variations of white and black or gray and black, covered in printed wings. In 2008, Jen Scheffler launched her Minnesota-based brand, Realia by Jen. She started making jewelry as a hobby, taking apart broken and vintage pieces and then putting them back together as new jewelry. “And then people wanted to buy them,” she says. After becoming part owner of a boutique in her hometown of New Prague, Scheffler’s jewelry gained traction and eventually she was able to launch her jewelry business full-time. Realia by Jen designs are available at Corset Styling and Nani Nalu in Edina. If you’re heading into Corset Styling, check out Scheffler’s Venus Spring 2015 collection, which includes items like a matching set of mint-hued earrings and bracelet. In these classic pieces, the stone is amazonite in an opal mint hue and all is set in antiqued silver. At the relatively new Parc Boutique at 50th and France, you can find leather goods made by Minneapolis’ Solid Manufacturing Co. The company was founded by Dan Cordell and Alex Worre in 2013, though they had been designing together for years. Solid Manufacturing Co. came about because Cordell and Worre believed there was a gap in the market for handcrafted products that will last. Though a young company, it has been growing steadily over the last two years due to their attention to detail and commitment to making quality products. “We want our products to outlive our customers … so we won’t sell a product unless we can be sure that we’ll be able to stand behind it forever,” they say. The leather goods are hand-cut, -dyed and -stitched, carefully inspected, and sent to stores like Parc Boutique. While you’re there, consider getting your special someone a braided bracelet or standard wallet. The bracelet is made with vegetable-tanned leather delicately braided to close with a solid brass snap, while the wallet is made with the same leather and solid brass button stud.